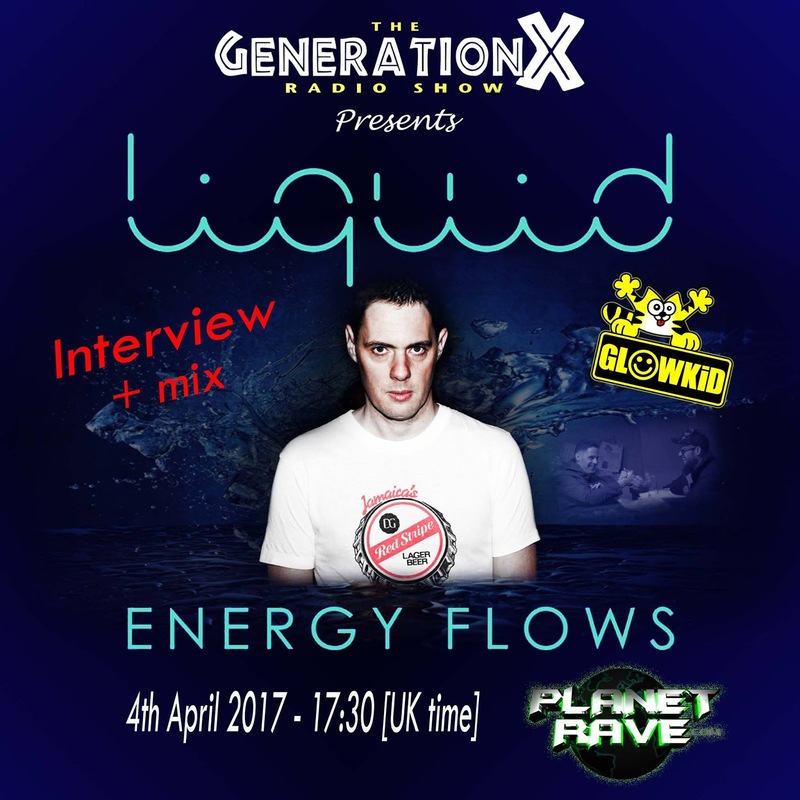 This show was recorded as broadcasted live @ Planet Rave Radio on 4th April 2017 - presented & hosted by GL0WKiD. I'm very pleased and honoured doing one more big & bright celebration of a show alongside a legend from back in the day, thus after Si from 2 Bad Mice and Luna-C, the almighty LIQUID (a.k.a Eamon Downes) has joined the forces @ Generation X [RadioShow] for some exclusive stuff and only! LIQUID, has an official studio return over the few last months, when he had announced his brand new album "ENERGY FLOWS" (pre-order now on Music Mondays here) coming out in 15th May, hence he has featured an Exclusive Mix on the show, including his fresh modern rave approach of his new stuff. An ideal way to introduce to us all on his new direction. And trust me, this mix and his new vibes are totally gorgeous! In addition there's also one more interesting Interview with him (this time a radio one) focusing on the progress of his album, Billy Daniel Bunter and Sanxion involvement, his collab with the established vocalists Rachel Wallace & Davina Myers as well as his future & present plans, some forthcoming collabs with Mark Archer and Sanxion to be released soon, the 25th anniversary of the anthemic 'Sweet Harmony' and finally his return to Greece @ this year's Unity In The Sun big 7dayer festival in Corfu. Enjoy the recording of the showcase and get yourselves into this outstanding full on Liquid trip as from the start till then end there are LIQUID vibes and only featured... From past to the future! As ever nuff respect 2 the one and only LIQUID!